I’ve tried yoga time and time again, and although I know it’s good for you and has health benefits, performing the poses in typical yoga classes just doesn’t grab me. Can’t get excited about it because it’s just toooooo slooowwww and there’s not enough action. 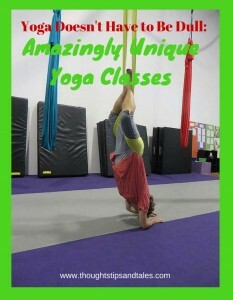 Aerial yoga uses light-weight hanging strands of fabric hanging from the ceiling as a support. Polga uses a pole dancing pole as a prop. And stand-up paddleboard yoga involves doing poses on a board out on the water and in the fresh air. Discovered that if you add a somewhat edgy — or non-mainstream — element to traditional yoga, it becomes a much more interesting experience! And the more “out there” a yoga class is, the more fun it is! What about you? Have you tried variations on traditional yoga? Do you enjoy unique yoga classes? This entry was posted in aerial yoga, polga, standup paddleboarding, unique yoga, yoga and tagged aerial yoga, pole dancing and yoga, polga, stand-up paddleboard yoga, unique yoga, yoga, yoga with a twist. Bookmark the permalink. Which is harder, stand up paddle boarding, or yoga on a stand up paddleboard? My first experience on a stand up paddleboard was about like yours, but I am going to try it again this summer. They’re both hard, but yoga involves being down lower on the board, so it’s a little easier, I think, than paddling. I can paddle a lot better on my knees than standing!